What Is The Book Of Life? Whose Names Are In It? There are some who believe that the Book of Life contains the names of every human who has ever lived or ever will live. Those names remaining at the end of time will be those who have eternal life. Only by rejecting Jesus are names ‘blotted out’ of the Book of Life. Others believe that God, before time began, listed those whom He knew would believe in Him and, in the end, only those people will be heaven bound. There are many differing opinions and theories as to just what the “Book of Life” is; however, I want to set aside those opinions and theories and look into God’s Word. What does the Bible have to say about this Book of Life? The apostle Paul addressed his fellow believers as, “…my fellow workers, whose names are in the book of life” (Philippians 4:3 ESV). This clearly tells us that Christians have their names written in the Book of Life. “The one who conquers will be clothed thus in white garments, and I will never blot his name out of the book of life. I will confess his name before my Father and before his angels” (Revelation 3:5 ESV). This passage tells us that perseverance is essential to one who has his or her name written in the Book of Life. Faithfulness to God is crucial to having one’s name secure in God’s kingdom. This verse also reinforces the fact that it is Jesus who determines whose name is, or is not, in the Book of Life. Alluding to the blasphemous ‘Beast’, the Bible says that, “…all who dwell on earth will worship it, everyone whose name has not been written before the foundation of the world in the book of life of the Lamb who was slain” (Revelation 13:8 ESV). Anyone who worships anything other than God exhibits proof that their names are not written in the Book of Life (see also Revelation 17:8). If there is anything in one’s life that is more important than God, that thing is an idol; the Bible makes it clear that idolaters will not have their names written in the Book of Life (1 Corinthians 6:9; 15:50; Galatians 5:21; Ephesians 5:5; 1 Timothy 1:9; Hebrews 12:14, 13:4; Revelation 21:8). What does the Bible have to say about this Book of Life? “And I saw the dead, great and small, standing before the throne, and books were opened. Then another book was opened, which is the book of life. And the dead were judged by what was written in the books, according to what they had done” (Revelation 20:12 ESV). When God judges us, the Book of Life will play a prominent role, “And if anyone’s name was not found written in the book of life, he was thrown into the lake of fire” (Revelation 20:15 ESV). God keeps a record of how each of us responds to His offer of salvation. He sent His Son, Jesus Christ, to die on a cross to pay for our sin, the sin that separates us from Him. It is our repentance or rebellion that determines whether or not we will spend eternity with Him in paradise or apart from Him in Hell. Speaking of the New Heavens and New Earth of the end times, Revelation says, “But nothing unclean will ever enter it, nor anyone who does what is detestable or false, but only those who are written in the Lamb’s book of life” (Revelation 21:27 ESV). Therefore, no one who is unclean has their name written in the Book of Life. We know that humans, on their own, have no righteousness (Isaiah 64:6); therefore, any righteousness we acquire must come from something (or someone) outside of ourselves. The Bible tells us that, “…much more will those who receive the abundance of grace and the free gift of righteousness reign in life through the one man Jesus Christ” (Romans 5:17 ESV, cf. Romans 3:22; 1 Corinthians 1:30; Philippians 1:11; 3:9). It is Jesus’ righteousness that grants us passage into eternal life and assures our names are written in the Book of Life. The only way to be assured that our names will be in the Book of Life is to be dedicated followers of Jesus Christ, “…if you confess with your mouth that Jesus is Lord and believe in your heart that God raised him from the dead, you will be saved. For with the heart one believes and is justified, and with the mouth one confesses and is saved” (Romans 10:9-10 ESV). Whether or not the Book of Life is an actual book or simply a metaphor for God’s record-keeping activities, the reality it speaks of is that one’s name must be in it to be counted among the redeemed. The Bible also makes it very clear that our names are guaranteed to be in the Book of Life purely based on our relationship with Jesus Christ. Jesus said that, “…everyone who acknowledges me before men, I also will acknowledge before my Father who is in heaven” (Matthew 10:32 ESV, cf. Luke 12:8; Acts 16:31). If we have trusted Him with our lives, we are heaven bound. If we have rejected His saving offer of grace, our names will be blotted out of the book, we are bound for eternal punishment (Matthew 25:46). More reading: What Does the Bible Say About Judgment? Hello Robert, I have always found the book of Revelation difficult to understand. Rev 20 vs 12 “and books were opened. Then another book was opened…“ OK I know that last book is the book of life, scripture is clear on that, but what are the 1st set of books? I would appreciate your views on this, and of course other`s views. Thanks for reading and commenting. I too struggle with understanding the book of Revelation, as I’m sure many other Christians do also. Depending on one’s preexisting theology, the symbolic nature of the book can be interpreted in many different ways. If one takes away nothing else from Revelation, one clear message is that God [Jesus] is King, Savior, Conqueror, Judge, and Creator of the universe, and He is fully worthy of our worship of Him. “And I saw the dead, great and small, standing before the throne, and books were opened. Then another book was opened, which is the book of life. And the dead were judged by what was written in the books, according to what they had done” (Revelation 20:12 ESV). The verse you asked about, whether the books are actual books or metaphors for records God is keeping, appear to illustrate the truth that every person is judged by what he or she does on this earth. Jesus said, “I tell you, on the day of judgment people will give account for every careless word they speak, for by your words you will be justified, and by your words you will be condemned” (Matthew 12:36-37 ESV). Paul wrote in Romans, “…on the day of wrath when God’s righteous judgment will be revealed. He will render to each one according to his works: to those who by patience in well-doing seek for glory and honor and immortality, he will give eternal life; but for those who are self-seeking and do not obey the truth, but obey unrighteousness, there will be wrath and fury. There will be tribulation and distress for every human being who does evil, the Jew first and also the Greek, but glory and honor and peace for everyone who does good, the Jew first and also the Greek. For God shows no partiality” (Romans 2:5-11 ESV). Now, lest anyone accuse me of saying we are saved (made righteous) by works, the Bible is clear that we are saved by faith in the atoning work of Jesus Christ (this faith is also a gift from God. Ephesians 2:8-10). And it is these ‘works’ which are judged; i.e. How did we respond to God’s gracious offer of salvation? Did we realize our sinfulness, repent of it, and place our faith in Jesus Christ…or did we stubbornly cling to our selfishness, autonomy, and sinful pursuits? These are the ‘works’ that will be judged (in my humble opinion based on the Words of the Bible). I don’t claim to have the final word on this, and I would love to hear other’s views on this. David, your questions, comments, and interaction are an example of the Biblical principle of iron sharpening iron. God bless you. FWIW, there are multiple books, which I believe to be a metaphor for the record which is kept by God. The first books mentioned in your quoted reference would be the record of our works. 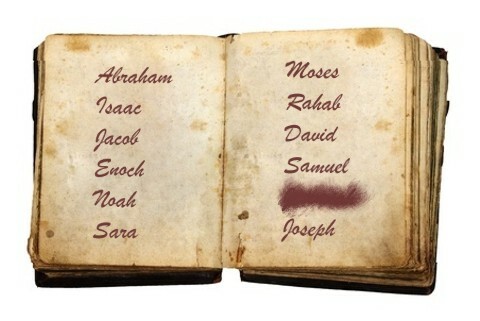 The second book, The Lamb’s Book of Life, contains one thing only….the recorded names of the Redeemed. On another note, I have been witnessing to an 83 year old man, who has grade four bladder cancer….a short timer. He is an intellectual and an avowed atheist, which is really an oxymoron. 3) The moral argument, which posits where we get our basis of moral standards from. He is recalcitrant. Please pray for Jim, as he will soon see whether his name is written in The Book. God have mercy on the unbeliever’s souls. This is such a war. If we could see with eyes unshielded I think we would all fall down prostrate in worship of our King, in wonder and awe at the armies engaged over the battle for our souls. Thanks for your answer to David, it helped confirm that I might be on the right track in my thinking, after all (ha ha). I will certainly be praying for Jim, that his heart would be softened and the truth would overwhelm him. Please let me know of any developments with him. God bless you. Reading this article and the comments. The Holy Spirit has prompted me to pray for this man also. I pray that he will receive the Good News in time. And, that God will soften his heart and open his eyes and ears to hear & accept Jesus as his Savior. Next post: Was Judas Saved?